A parliamentary report of 1777 recorded parish workhouses in operation at North Narberth (for up to 10 inmates), Begelly (3), Jefferston (5), Lampeter Velfrey (6), and Mouncton (26). Pembrokeshire: Amroth, Begelly, Bletherstone, Clarbeston, Coadcanlap, Crinow, Crunwear, Eastwilliamston, Jeffreyston, Llampeter Velfrey, Llanddewi Velfrey, Llandilo, Llandysilio (part of), Llangolman, Llanhaden, Llanvalteg (part of), Llanycefn, Llys y fran, Loveston, Ludchurch, Maenclochog, Martletwy, Monachlogdo, Mounton, Mynwer, Newmoat, Newton, North Narberth (2), Reynelton, Robeston Watham, Slebech, South Narberth, St. Issells, Yerbeston. Carmarthenshire: Castle-dyran, Cyffie, Eglwsys-limmin, Egremont, Henllan Amgoed Llanboidy (2), Llandysilio (part of), Llanvalteg (part of), Marros, Pendine. Pembrokeshire and Carmarthen: Cily Maenlwyd, Llangan. The population falling within the union at the 1831 census had been 20,530 with parishes ranging in size from Mounton (population 41) to the combined parishes of Narberth (2,589). The average annual poor-rate expenditure for the period 1834-36 had been £5,538 or 5s. 5d. per head. Initially, three existing parish poorhouses within the Union continued to be used. Then in 1837, the Board of Guardians decided that a new single workhouse should be built. 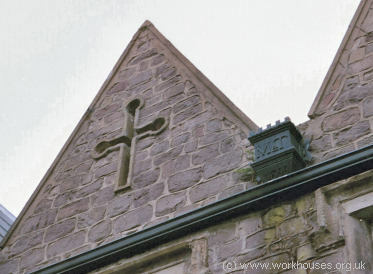 The Narberth Union workhouse, for 150 inmates, was erected in 1838-39. 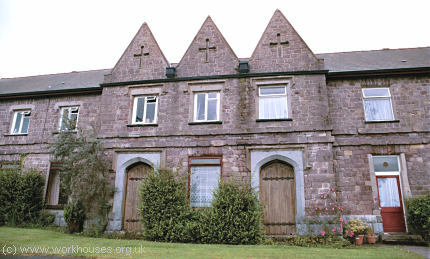 The Narberth Board of Guardians decided to use the same architect, William Owen, and design as were being employed for the adjacent Haverfordwest workhouse which was already under construction. The site chosen was at Narberth Mountain, about a mile to the south of the town of Narberth. The building contractors were J Thomas and Son of Narberth, who had submitted a tender of £2,220. Completion was scheduled for 1st December 1838 but delays put this back to 16th January 1839. Part of the delay in completion was caused by a mob attempting to burn down the new building. Special constables were employed to protect the site. The Guardians also had financial disputes with the builder who was dismissed in April 1839, leaving the perimeter walls unfinished; they were later completed by another contractor, William Lloyd. On 10th June, 1839, the Narberth Board of Guardians had their first meeting in the boardroom at the new workhouse which became known as Allensbank. The workhouse location and layout are shown on the 1908 map below. The workhouse was based on a square plan, consisting of three parallel ranges linked by a central spine. The buildings were constructed from a local stone in a simplified Tudor style with little ornamentation. The north range contained the main entrance, or rather entrances — these may have been separate doors either for males and females as at Bridgend, or for the main workhouse versus the relief office and board-room as at Pembroke. The north range included the Guardians' boardroom, schoolteacher's room, male and female receiving wards, and a bathroom. There was also a small windowless punishment room known as the black hole. Narberth north range from the north-east, 2000. 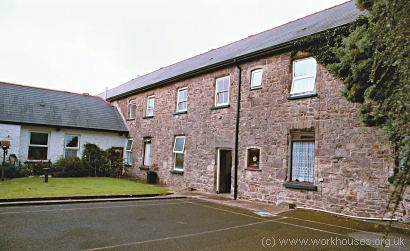 Narberth workhouse entrances from the north, 2000. Narberth rear of north range from north-east yard, 2000. The central range contained day rooms for men, women, boys and girls, and a foul ward (for inmates suffering from venereal diseases). The central north/south spine contained the master's accommodation and the kitchens. At the centre of the building was a dining room. Like Owen's design at Haverfordwest, the Narberth lacked the central supervision hub found in many workhouses of this period. Narberth central range and central spine from the east, 2000. The south range contained a further women's day room, a day ward for old women, plus the vagrant ward and wash-house. The four courtyards created between the workhouses ranges were used as exercise yards for the inmates and also contained wash-troughs and latrines. 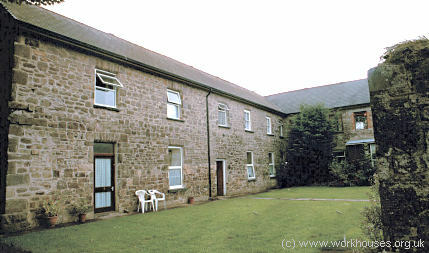 Narberth south range and south-east courtyard, 2000. Narberth general view from the south-west, 2000. A small gate-lodge stood at the entrance to the workhouse. In 1843, the workhouse was under attack again, this time by a mob of several hundred Rebecca Rioters who, amongst other things, were conducting a campaign against the introduction of local road tolls. The Castlemartin Yeomanry had to be called out to keep the rioters at bay. 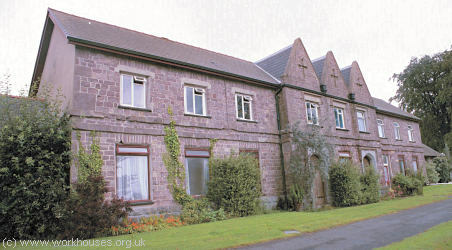 After 1930, the workhouse was redesignated as a Public Assistance Institution and became known as Narberth Lodge Hospital. In around 1948, it became an old people's home. Later renamed Allensbank, it was sold into private ownership in 1965 and finally closed in 1972. The buildings have now been adapted for use as holiday accommodation. Pembrokeshire Archives, Prendergast, Haverfordwest SA61 2PE. Holdings include Guardians' minute books (1837-1947 with gaps); etc.